Quality Assurance and Version Control Bundle - Defining quality means developing expectations or standards of quality. Standards can be developed for inputs, processes, or outcomes; they can be clinical or administrative. Standards can be applied at the level of an individual, facility, or an enterprise. A good standard is explicit, reliable, realistic, valid, and clear. Standards of quality can be developed according to the Dimensions of Quality and should be based on the best scientific evidence available. Stakeholder (including client and community) expectations of quality should also be incorporated in the definition of quality standards. Defined standards or definitions of quality are prerequisites for measuring quality. If standards don't exist, they must be designed. Although standards are context-specific, universally accepted standards are often a good starting point for developing local standards. To achieve these goals for Information Technology Janco has combined some of its most popular products to help CIO and IT organizations to meet the most stringent Quality Assurance and Control Standards. Security Policy Template - Security Manual for the Internet and Information Technology is over 220 pages in length. The Security Manual template includes both the Business & IT Impact Questionnaire and the Threat & Vulnerability Assessment Tool (both were redesigned to address Sarbanes Oxley compliance). 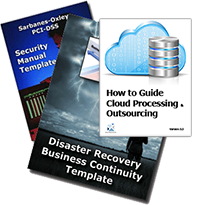 Disaster Recovery Template - The DRP template is over 200 pages and includes everything needed to customize the Disaster Recovery Plan to fit your specific requirement. The electronic document includes proven written text and examples. Record Classification, Management, Retention, and Destruction policy - The Record Classification, Management, Retention, and Destruction policy is a detail template which can be utilized on day one to create a records management process. Included with the policy are forms for establishing the record management retention and destruction schedule and a full job description with responsibilities for the Manager Records Administration.